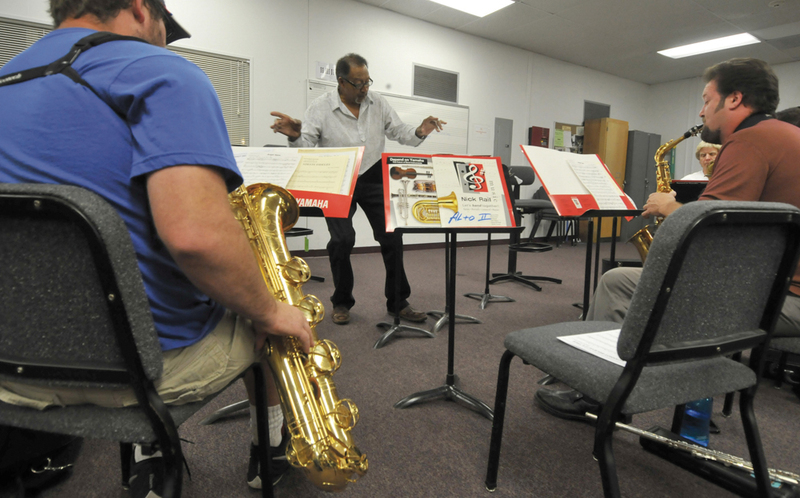 Ike Jenkins nurtured generations of jazz band and choir members at La Cumbre Junior High, Dos Pueblos and Santa Barbara high schools, and at City College (pictured here), gently teaching life lessons that went well beyond music. After hearing the news of Ike passing away on December 1, my heart completely sank and I felt physically sick. How could this happen? He was just in the hospital, and everything was okay. But our Lord felt the need to bring him home, and I am left feeling thankful for the years I was able to share with him. I first met Ike in 1976, when I was in the 7th grade at La Cumbre Junior High School. We all called him Mr. Jenkins back then. He was the band teacher, and I was a pudgy kid who played the trombone. During the next three years, I started playing the electric bass, and by 9th grade, I was fortunate enough to play in his Jazz Band. Those years at La Cumbre were a foundation that shaped my life as a musician. It was Mr. Jenkins’s intelligence and patience as a band instructor that kept me interested in playing music. There are so many unique stories about his music classes. One of the things he did was really encourage us to “listen” to the music we were going to perform. Usually a band director will present a group with sheet music, and we’d just start playing it down. Mr. Jenkins would find recordings of the music, and we’d listen to it first, talking about what instruments stood out to us, how the dynamics worked, and what kind of emotions we felt. This was an amazing approach, and I treasure the memory of how he showed us the importance of interpreting music in this way. 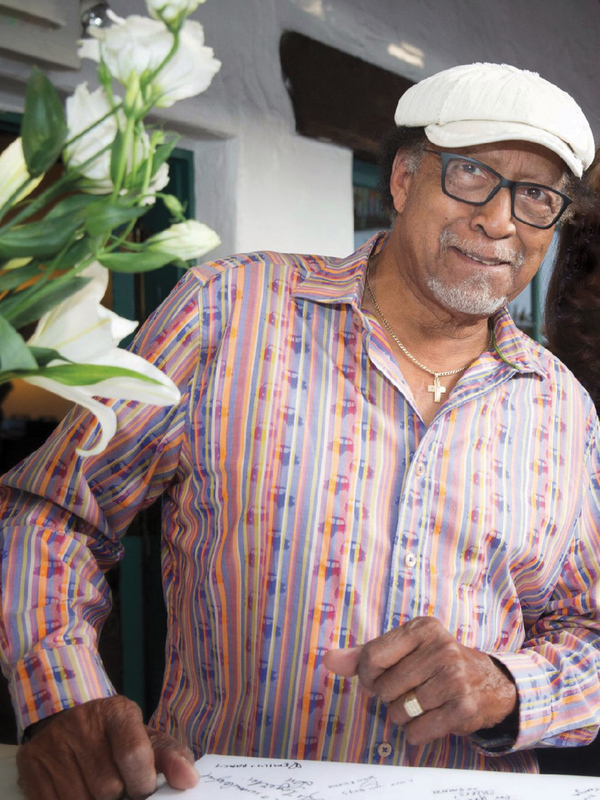 Ike stayed in touch with me throughout the years, and I visited him when he was teaching at Dos Pueblos High, Santa Barbara High, and the occasional Monday at SBCC with the madness band. It was always so special to see him as I grew older; he never seemed to change. He was always interested in what I was doing, what music inspired me, how my life was going, if I was happy. That seemed to be one of the most wonderful of Ike’s attributes. He was genuinely interested in “you.” He showed this concern with his students and the people who came into his life. I can see him right now in my mind’s eye as he’s listening to someone talk, his expression displaying a true sincerity in listening to what they have to say. Dirk and I are now bandmates in the swing band Big Bad Voodoo Daddy, but if Isaac Jenkins hadn’t been in my life, there’s absolutely no way I would have become a musician. Before I met Ike in a class at Dos Pueblos, I had no clue that I had any talent or ability, or even that I especially liked music. Band rehearsals with Ike were like a vortex in time: High school would stop, and the rest of the world ceased to exist. Ike always encouraged us to have a part in changing the music itself and to change the arrangements ourselves. If we were into funk, ska, or reggae, we’d add a section to a song that incorporated those grooves. So many band directors buy sheet music and charts and have the band play it as-is. But with Ike, there were no rules; there was just musicality. We’d take a handful of song arrangements and work on them for months. How are the melodies supposed to feel? What are the dynamics of each section? How can we make one section of music build into the next? Is it any wonder that Ike was able to get a bunch of suburban kids from Goleta to swing? He’d break each phrase down and talk about how the long and short notes work together to get a swing feel. Ike would also encourage us to think about the performance aspect. We would work out choreographed moves in the horn section. Ike was always changing the look of what his jazz bands wore onstage, and not unlike the music arrangements, Ike often let the students decide. When we all knew we looked good as a band, we were more confident as performers. We’d show up to competitions in custom-made, color-coordinated jackets, while every other band had the requisite black suit, white shirt, and black tie. Ike stressed the importance of looking sharp and professional, not because it was something society expected, but because he knew you’d feel better about yourself. I’ve never again experienced the presence that I had during those intense times. Ike motivated us to extract the very best of ourselves. You wanted to be good, of course, but more than that, you wanted to impress Ike. Plus, it didn’t hurt that Ike was cool. He was larger than life. A wrestler in high school, Ike remained athletic his entire life. He had a huge physical presence. He would typically speak softly, but he could very easily modulate his voice into a sonic boom, the benefits of his vocal training, no doubt. No matter the era, Ike always had his own unique take on the leading edge of style. Ike never tried to be cool. He just was. Ike always built people up and never tore anyone down. He would enthusiastically talk about former students and, in effect, made them legendary. He created an almost reverent aura about them that was tangible. His tributes to his former students made you feel that what they achieved was something you also could aspire to. You wanted to be one of those revered students he talked about. I know I sure did. If Ike were only an amazing music instructor, that’d be one thing, However, he was so much more, a mentor, a counselor, and most importantly a friend. Even after I finished high school, Ike and I remained close friends. We’d get together and have lunch and catch up often. He always made a point to tell Dirk and I how proud he was of us, and coming from him, there was no greater compliment. He’s always been the biggest supporter of my musical quest. I’ve been able to travel and see the world because of Ike Jenkins, and been able to support myself and my family while doing what brings me tremendous joy. A memorial for Ike Jenkins will be held at First Presbyterian Church, 21 East Constance Avenue, at 1 p.m. on Saturday, December 22.